The pork knuckle served at Tawandang caught my eye because of its inherent crispy thin skin. The prawn cakes were wallops of flavour encapsulated inside an outstanding batter. The grilled pork slices have sufficient fat, its sauce is terrifically compatible and the meat tender as it slides into our mouths. Its spring rolls has crab meat and the salted fish fried rice is accompanied by kale. Bright looking king prawns sit on a hot pot of vermicelli. TIME magazine acknowledged its Bangkok based parent restaurant in 2003. The love for beer and good spicy Asian delights - what can more more potent to help one relax? Most major conurbations in the world has a hinterland, valley or coast nearby, for which its residents can seek escape from modern urbane life. For the people of Cape Town, it is the coast down south or getting into north-west into vineyards and more rural greenery. 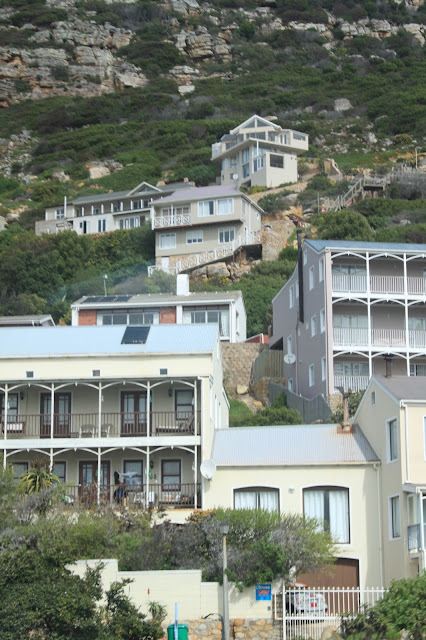 I had the privilege of discovering Simon Town's two months ago, a delightful enclave with a calm sky blue bay and several interesting activities to dwell in - lunching, strolling on board walks, immersing in the village atmosphere and checking out tourist moments. False Bay provides pretty vistas and views, the Table Mountain National Park rises behind and the place says lifestyle through and through. Houses nestle up on the hills and the hint of coming warm months expressed itself in clear blue skies.